Hundreds protest against the tar sands on Parliament Hill in Ottawa September 26, 2011, with many climbing over a fence between them and police in a mass act of civil disobedience. Here, one of the organizers of the event, President of the Communications, Energy and Paper Workers Union, Dave Coles, is the first to climb the fence and be arrested. Maude Barlow (far left) was in the first wave over the fence and was led away by police. OTTAWA — Prime Minister Stephen Harper’s government blasted critics of its environmental record as “extremists” on Monday as the oil and gas industry launched a new public relations campaign which coincided with civil disobedience on Parliament Hill over a controversial U.S. pipeline expansion project. If approved this year by the Obama administration, the multi-billion dollar Keystone XL project, proposed by Alberta-based TransCanada, would provide a new 3,100-kilometre route for about 700,000 barrels of oil per day from Alberta to 15 refineries on the Gulf Coast of Texas. Alberta and federal government officials have touted the project for its economic benefits, including thousands of new jobs in both countries, but environmental groups have turned the project into a debate over expansion in the oilsands sector — which requires large amounts of water, land and energy to extract synthetic oil from Alberta and Saskatchewan’s northern bitumen deposits. While First Nations leaders and environmentalists criticized the industry for damaging natural ecosystems from expansion and recent accidents on some pipeline routes from various companies, the government dismissed questions from the opposition about the absence of regulations to crack down on rising emissions. Oliver made the comments after about 100 protesters from First Nations communities and environmental groups crossed a police barricade on the Parliament Hill lawn and peacefully allowed the RCMP to arrest them for the action. The protesters who were arrested included Maude Barlow, national chairperson of the Council of Canadians, an advocacy group promoting social justice issues. Many of the protesters chanted for “justice” and to “stop the tarsands,” with NDP MP Dennis Bevington and Green party leader Elizabeth May in attendance. Jackie Thomas, the chief of Saik’uz First Nation, a member of the Yinka Dene Alliance, blasted industry executives for trying to buy support through agreements with Aboriginal communities for development projects that would go through their land. While TransCanada officials have said the pipeline will have leading safety standards and efficiency, the main lobby group representing the oil and gas companies began a new marketing offensive in partnership with a former environmentalist, Patrick Moore, who has worked as a paid consultant for industry groups since the 1990s. In the campaign, launched by the Canadian Association of Petroleum Producers, Moore, who describes himself as a co-founder of Greenpeace, praised oilsands producers for efforts to reclaim or restore land and ecosystems disturbed by open-pit mining and tailings ponds. According to the Pembina Institute, an environmental research group that also does consulting work for oil companies, the province of Alberta has only certified 0.15 per cent of land disturbed by oilsands mining as fully-reclaimed sites. The oilsands sector has seen its greenhouse gas emissions grow by nearly 300 per cent since 1990. It now produces more pollution per year than all of the cars on Canadian roads and roughly the same amount of pollution as light-duty trucks. It has reduced the average amount of emissions for each barrel by about 30 per cent since 1990, but the most recent statistics released by Environment Canada show that it is no longer making those gains. But Oliver noted that the industry represents 0.1 per cent of global greenhouse gas emissions — equivalent to the pollution from coal-fired power plants in the state of Wisconsin. Oliver, and his colleague, Environment Minister Peter Kent, dismissed concerns raised in the House of Commons by the New Democrats and Liberals about the government’s failure to introduce regulations to crack down on the industry’s growing carbon dioxide emissions, which are projected to cancel out gains made by other sectors and prevent Canada from meeting targets agreed to by Harper under the Copenhagen agreement on climate change. Oliver said the government is also spending billions of dollars on initiatives to promote clean energy and alternative energy, and to improve the efficiency of conventional energy. As the second wave of protesters moved toward the barrier, six of them sat on the ground in defiance of the 50 RCMP officers lining the barrier. Some officers knelt next to the protesters, recording information from their passports. One officer held a camera to record the protest. Dozens of officers stood around the protest, even watching as one protester in a wheelchair was helped over the barricade. 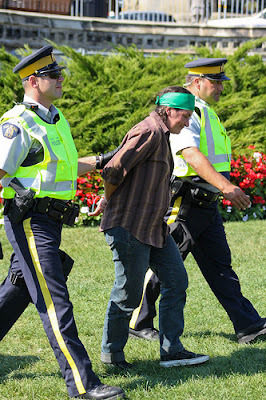 Brent Patterson, political director of the Council of Canadians, said the organization anticipated mass arrests, so activists underwent legal briefings as a precaution. “There’s so much concern right across the country around the tarsands, the destruction of water, the impacts on First Nations people and the amount of climate emissions released. 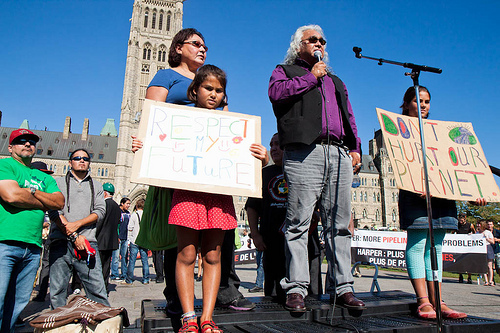 There’s concern that the Harper government isn’t listening and actively promoting the expansion of the tarsands. 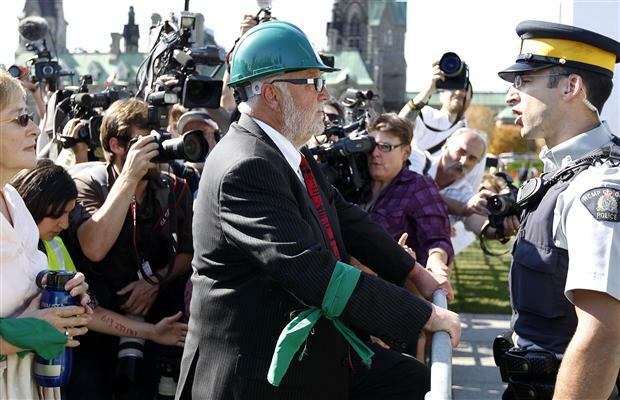 This (protest) brings the message directly to Parliament Hill,” Patterson said. Brigette DePape, the former page who held up a “Stop Harper” sign in the House of Commons in June, told the crowd she was happier being with the group of activists Monday than in the House and insisted they were on the verge of forcing change “for another possible Canada,” she said. 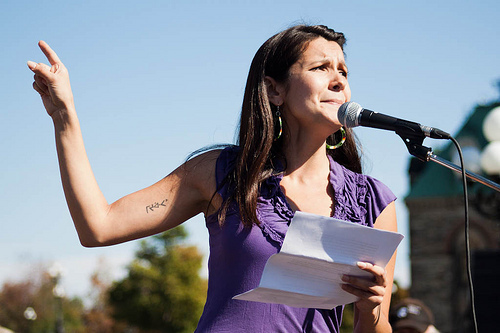 Melina Laboucan-Massimo, a Greenpeace energy and climate campaigner, said that if she brought samples of the water her Cree Lubicon First Nation in northern Alberta has access to, no one would drink it in the aftermath of a major oil spill in April of millions of litres of crude oil from a pipeline owned by Plains Midstream. “Our way of life is no longer the same. Our ecosystem is destroyed,” she said. She said her family members living in the community had burning eyes, headaches and nausea after they relied on the water, food and berries they used to collect on their territory. She also questioned whether officials did enough in response to the Rainbow Pipeline accident, one of the largest in Alberta history. “The government denied the severity of an oil spill,” putting communities and her family at risk, she said. This entry was posted in Events, Organizing, Tar Sands and tagged Protests. Bookmark the permalink.